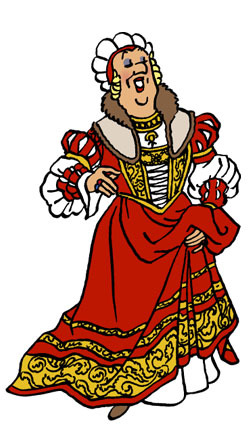 Bianca Castafiore, also known as "the Milanese nightingale" because of her association with La Scala opera house in Milan. According to Hergé she is 45 years old. Although the press has often reported her engagement to various men, "the Milanese nightingale" has no real family, as far as we know. She travels with her faithful companion, Irma, and her accompanist, Igor Wagner. As in his approach with Tintin and Haddock, Hergé brings together several ingredients to form the character of Castafiore. First of all he had an aunt, Ninie, who during his childhood would regale the Remi household with her loud and shrill singing to piano accompaniment. Her performances did nothing to foster a love for music, let alone for opera, in the young Georges Remi to match his early enthusiasm for drawing and later love of the visual arts. In fact, it probably contributed to his inability to discover any appeal in opera, a form of artistic expression that he found rather ridiculous and beyond credibility. "Opera bores me, to my great shame. What's more, it makes me laugh," Hergé admitted. And so, perhaps not surprisingly, he created an archetypical singer who makes us laugh. From this stereotype, which Tintin and his readers first encounter in King Ottakar's Sceptre, Hergé refines and develops the character of Castafiore as he deploys her in subsequent adventures. It was in the 1950s when the newspapers and magazines such as Paris-Match, a favourite source of material, were full of the sensational opera career and private life of Maria Callas that Hergé found his real model for Castafiore. The 1950s were Callas's golden years when she was winning worldwide acclaim for her legendary performances in Milan, New York, Chicago, London and Paris. By 1964, Sir David Webster, Director of London's Covent Garden Opera House, could describe her as "the greatest theatrical musical artist of our time." She was" La Divina," arguably the world's most famous operatic soprano. Bianca's calling card aria - sung throughout the adventures - was typically an inspired choice by Hergé: the Jewel Song from Charles Gounod's grand opera Faust, Florid, dramatic, demanding the greatest virtuosity, it describes the moment in Goethe's tragedy when the young Marguerite finds the casket of jewels left by Mephistopheles, tries them on and, regarding her reflection in a mirror, is dazzled by what she sees. The music breaks into waltz time as she declaims: "Ah, my beauty past compare: these jewels bright I wear! Was I ever Margarita?" In May 1963, the year of publication of The Castafiore Emerald, Callas recorded Gounod's jewel aria in the Salle Wagram in Paris, with the Orchestre de la Société des Concerts du Conservatoire, under Georges Prêtre. Real life was again echoing Hergé's world. For all her overpowering vanity, Castafiore displays two notable qualities in The Adventures of Tintin: her loyalty and her courage. When the villainous and lecherous Sponz, reminiscent of the odious Scarpia in Puccini's opera Tosca - one of Maria Callas's great roles - gains access to Castafiore's dressing room in The Calculus Affair, his intentions are transparent. Her real courage is manifest when she stands in the dock at the Palace of Justice in Tapiocapolis. In a pink couture suit, broad-brimmed white hat heavy with flowers, she applies lipstick, completing her make-up as the Public Prosecutor rants: "For this siren with a serpent's heart, this gorgon with a voice of gold, I beg, I implore, I demand, IMPRISONMENT FOR LIFE! Refusing to be crushed, she shows her contempt for the absurd process by breaking into the Jewel Song with her customary brio: "Aaah! My beauty past compare!" While singing about jewels, like Maria Callas she has an obsession with them. The famous emerald central to the plot in The Castafiore Emerald is matched by any emeralds possessed by Callas, who was a passionate and discerning collector of fine jewellery. In fact, it bears a remarkable resemblance to a claw-set emerald (weighing 37.56 carats) and diamond ring auctioned by Sotheby's in Geneva in November 2004 - 27 years after the diva's death. Regarding Castafiore's emerald, we learn from her - between sobs - that it was a gift from the Maharajah of Gopal. While Professor Calculus's affection for her remains unrequited, Captain Haddock for all his resistance does seem to be more "fortunate". His accidents in The Castafiore Emerald bring out the prima donna's maternal instincts as she fusses over him, administering to his bee sting or pushing his wheelchair around the garden. It is hardly surprising that the "Paris-Flash" (a thinly disguised Paris-Match) journalists sense romance and forthcoming nuptials. There is the clinching moment in Tintin and the Picaros when liberated from her prison cell, holding an empty pasta plate, she rushes headlong towards Captain Haddock (or ?Hemlock? as she incorrigibly calls him on this occasion!) undeterred by: "Come caro mio!... Come to my arms! I knew you'd come to rescue me from this dreadful place!" A tear rolls from her eye as she embraces the reluctant mariner and Hergé draws hearts around her like a halo! If she feels love for Haddock, it is not exclusive. She lists in The Castafiore Emerald a number of admirers: "The newspapers have already engaged me to the Maharajah of Gopal, to Baron Halmaszout, the Lord Chamberlain of Syldavia, to Colonel Sponz, to the Marquis of Gorgonzola, and goodness knows who. "Like Narcissus, real love is reserved for herself. Poor Professor Calculus, who - despite his roses and old-fashioned chivalry - has no real chance of amorous success. He may have been able to conquer the moon, but not that Milanese nightingale, Bianca Castafiore. Meanwhile from being the rather matronly and frumpy dramatic soprano first encountered in 1938-39, Castafiore becomes - à la Callas - super elegant and fashionable. She is rejuvenated and is certainly more attractive in Tintin and the Picaros, than 38 years earlier at her initial meeting with Tintin in Syldavia. Such is the transformation that one should not be totally surprised by Professor Calculus's apparent infatuation with the diva in The Castafiore Emerald. Ugh! She is very loudmouth! He really HATE her so much! He always run away from her. I believe she is a witch. sooo wonderful!! im her biggest fan! !